Our world seems more in turmoil than ever. Each time we turn on the news, there’s too much to absorb. Each headline is more concerning than the last, and we may be tempted to unplug and move to a desert island. Worse, I’ve had a nagging suspicion that what I do is unimportant, maybe even trivial. Recently I was at a party where I met a psychologist. “Now,” I thought, “there’s work that is important. She’s helping people make sense of their lives.” When she found out that I am a novelist, her face lit up, and she said, “You must be so proud to know that what you do helps people relax and be entertained and escape their problems form a while.” Her words were exactly what I needed to hear. Being an artist, whether we’re a painter, musician, dancer, actor, or writer is important right now. As artists, we do provide the means of escape from reality for a few minutes, we help make sense of the senseless, and we become historians of our time revealing what’s important to our society. And so I wondered … what traits see writers through the euphoria of being at the top with accolades, multi-book contracts, and movie deals … and see writers through crushing rejection, personal problems, and outside distractions? I identified seven that apply to all artists, though the frame for them comes from the world I know—writing. I chose the words “effective writers” to describe these traits rather than “successful writers” because effective identifies intent, and successful identifies outcome. Plus, what does “successful” mean—is getting that submission in the mail, making a best seller list, earning a certain amount of money? Whatever the definition, we usually are not successful unless we are first effective. A favorite song since childhood is from Pinnochio–When You Wish Upon a Star. If I had a theme song, this would be mine. 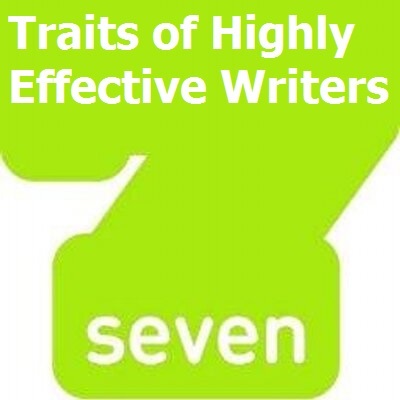 What does this have to do with the seven traits? Quite a lot, actually. Effective writers dream. All things begin with a dream. That wonderful book you read this week was gathered from the ether and turned into the tangible form of a book because the author had a dream. Back to my theme song. The lyrics say, in part, “anything your heart desires will come to you when your heart is in your dream.” Within your deepest yearnings, what do you wish for? Large or small—the important thing is that your dream sings to you from the bottom of your heart. Effective writers have courage. We tend to associate courage with the heroic acts of fire fighters or soldiers or police officers. But, it takes a lot of courage to expose yourself the way we inevitably do as artists and put our work out there for someone else to see. Most of us have had the horrible feeling after we’ve released manuscripts into the world that we have missed some key thing. We fear the stupid typo or wish a character’s motivation would have been a bit more clear – and all of it with that fragile hope of “let them like my work, oh please, let them like it.” You may be one of those who never finds the process of sharing your work easy. That’s okay. Just take a deep breath … have courage and share your work anyway. Effective writers are disciplined. No matter how big the dream, the work simply doesn’t get done unless you set aside the time to do it. You know the drill. The distractions of social media, the rolling news feed, and games are not writing. Thinking about writing while you do the laundry isn’t writing (although, more than a few story problems have been solved while doing laundry). You must set aside the time, religiously stick to it, and do nothing but write during that time. Whether yours is a daily or weekly schedule, the more you make your writing time a sacred habit, the easier being disciplined will be. Effective writers renew through reading. Yeah, yeah, like you need encouragement to indulge in one of your favorite past times. The next time you read a good book, notice how reading makes you feel. Do you read with the knowledge that the author is skilled at drawing you into the story world and everything about it is working … and do you wonder how does the author does that? Do you read with the irritation of knowing you write as well? While reading, do you have those “ah-ha!” realizations for your own writing? Reading widely is an integral part of the creative process. Reading within your targeted market is a must. You learn to recognize good writing and good technique, which in turn teaches you to recognize what works and doesn’t work within your own work … and why. Effective writers appreciate their unique gifts. While it’s true that others may compare your style to some other author, your voice, your view of the world, and your choice of subject matter are all unique to you. No one can tell a story quite the way you can. Nor, can you tell a story quite the way someone else does. Isn’t that great? So, instead of wishing you could whatever is hot right now, cultivate your strengths and play them up. Effective writers take nothing personally. This ties in with having courage. Your ability to do well over the long haul will depend on how you frame both rejection and success. “Success” and “rejection” are outcomes and may not be fully within your control. Though a positive attitude is preferable and sets your intention, “success” and “rejection” are not something you do. All you can control is the work and how you choose to spend your time. Unless you take the steps that come after dreaming, all you have is a day dream–a pleasant fiction that keeps your mind occupied and wistful. The end of When You Wish Upon a Star says “fate is kind … fate steps in and sees you through.” In my experience, that’s true … if I’ve done the work to keep my dream from simply being a fantasy that engages me sometimes.